Last week I shared that I found a free piano on Craigslist and gave it some new life with a little paint and new fabric. Back today to share a little about what we did. 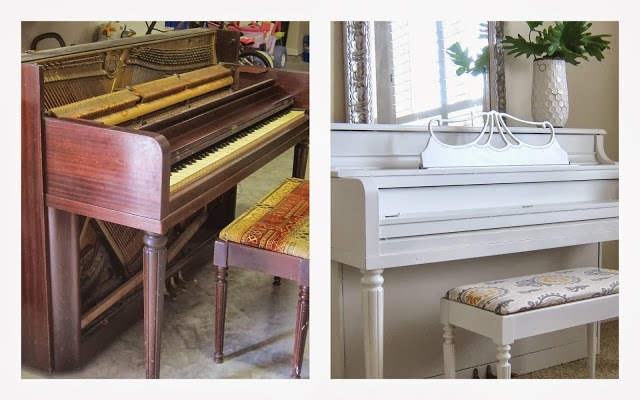 After our amazing experience with painting our kitchen cabinets white by spraying them, we decided that was the way to go with the piano as well. The finish is just so smooth and professional looking with the spraying technique. 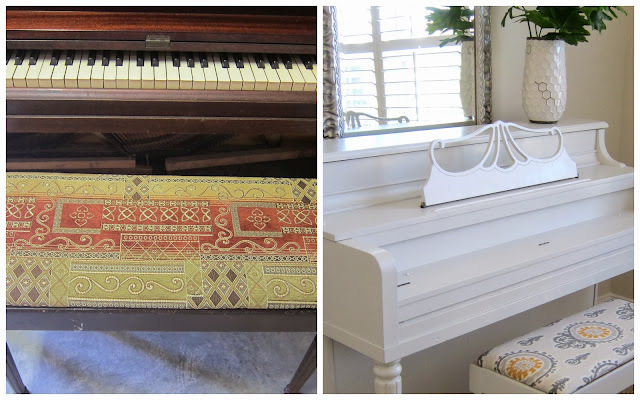 Now I know some might think I'm crazy to paint a piano, but really there was nothing to lose painting it, since it was a) free and b) not a heirloom piano. So we took the plunge! To ensure that the keys and internal piano parts were protected we took our time and carefully taped and covered everything before we started painting. This was the most tedious part, but so important. After we felt the internal parts of our piano were fully protected we started priming it. We used Kilz original primer. Once the primer was dry, we gave it a very light sand. To paint it, we used the same paint sprayer we used to paint our office furniture. We picked up this paint sprayer at the hardware store for $11 and attached it to our air compressor. We diluted our paint (Kwal acrylic paint) with water to a consistency thin enough to be sprayed. 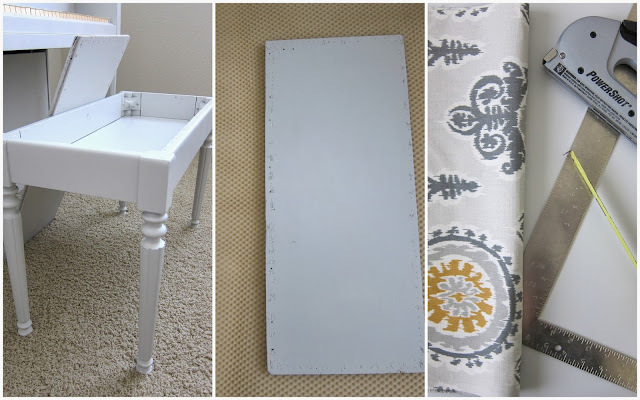 (tip: before we started we spent some time experimenting with the diluting and tested it on scrap boards to get the right consistency and method down before we started on our furniture) With spraying, the paint is very thin and dries really fast, so we were able to do three coats rather quickly. I love the finish this spraying technique produces. A nice, clean, smooth finish with no brush strokes. Next up was replacing this very dated fabric on the piano bench. Really a super easy process once I finally found a fabric I liked. Again, trying to not spend a lot of money on this project, I was thrilled to find this gorgeous fabric for $8.99/yd at Hobby Lobby of all places. For the padding, I used foam from my daughter's old nap mat that she had outgrown. I cut it to size with enough to cover the top and sides. I added a small amount of wood glue to hold it in place. Next I cut my fabric to size and stapled it to the inside of the board. I placed the hinge back on and attached it back to the bench and it was done! So happy with how it turned out! What an amazing DIY project and for $18!! So so awesome! I love it! We really need to get a paint sprayer soon. It really does make jobs so much easier. I love the fabric you chose too. Looks great Becky! Yes, the paint sprayer is wonderful! We love it!! Wow! Great job! I would never think to do that! Looks beautiful! The piano looks awesome!!! I love how did it all for so cheap! I'm so jealous you found the piano for free on craigslist!! I love the white color you went with and the fabric for the seat looks great with it! Good job!! i love this so much. and if i ever see a free piano on craigslist, i'm absolutely doing what you did!!! amazing! 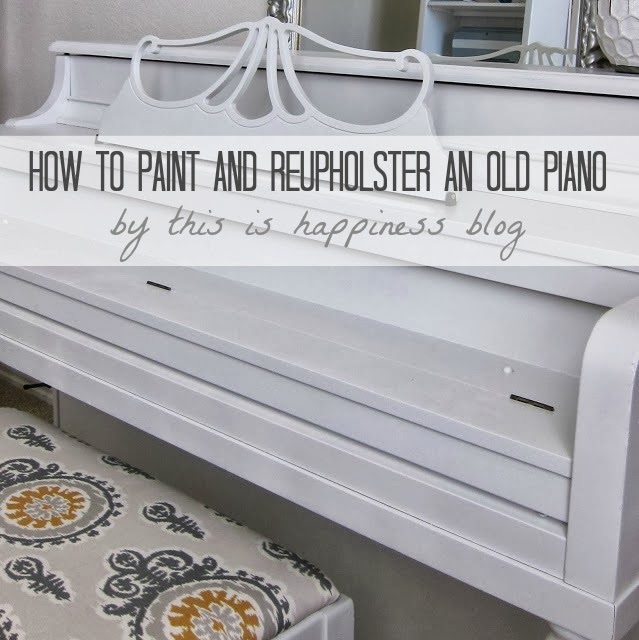 I would never have thought about re-painting a piano but it looks fantastic. Good for you! You did a beautiful job. This looks absolutely beautiful and I love what you have done with your office as well. I too have a piano that I am looking to paint. I just had one question...do I need to do any sanding prior to applying the Kilz primer? I saw where you did a light sanding afterwards but was concerned about the primer not sticking well to the glossy finish on my piano. I'm hoping all I need is the light sanding afterwards and this will be a super simple project!! Thanks in advance for your help!